Glaciations were the most conspicuous natural phenomenon which affected the evolution of Northern Eurasian landscapes. As a result of the expansion of vast ice sheets, the geomorphological systems were repeatedly restructured, large ice-dammed inland basins formed, coastlines shifted by hundreds of kilometres, and the migration of flora and fauna occurred. The cryogenic phenomena formed an important component of the environment in Northern Eurasia since the strong climatic cooling in the Pliocene (2.7-2.1 Ma BP). It is still unclear whether the ice sheets existed on the plains of Northern Eurasia during the cold phases of the first Eopleistocene climatic macrocycle. The second half of the Eopleistocene, however, was cold enough for the ice sheets to spread across the East European and West Siberian plains. Glaciation and other cryogenic processes reached their maximum development in the Pleistocene in line with a general climatic cooling and superimposed fluctuations whose amplitude was progressively increasing and whose period was shortening. At least four warm and four cold intervals have been recorded in the early Pleistocene (700-400 Ka BP). There is no conclusive evidence that ice sheets developed during the two earliest cold phases. 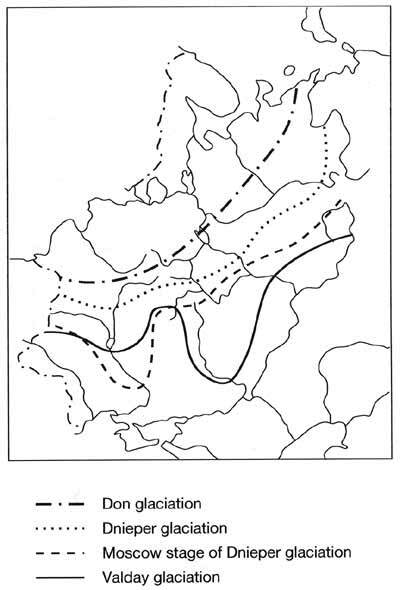 However, it is possible that the two earliest tills of the central East European plain (the Setun and Likhvin tills) may be attributed to these glaciations. In the second half of the early Pleistocene, the Don glaciation (Table 2.1), which was the most extensive of the whole Pleistocene, occurred (Velichko, 1980b). In the Don basin, its lobe reached 48-49°N (Figure 2.2). Traditionally, the Don lobe was attributed to the Dnieper glaciation of the middle Pleistocene. 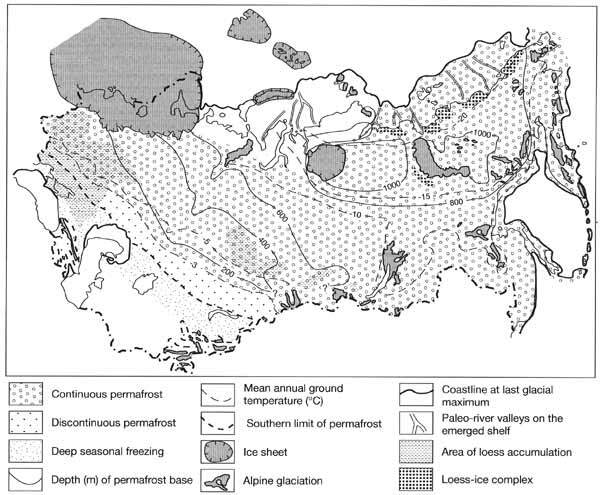 However, stratigraphic studies of the till in relation to loess and fossil soil horizons, substantiated by paleontologic data, proved the early Pleistocene age of the Don ice sheet (Velichko, 1980b). The centre of this ice sheet was located in the north-east of the East European plain, possibly in the Ural mountains. The till of the next Oka glaciation, the last of the early Pleistocene, occurs north of Moscow. Its boundaries have not yet been fully established. The occurrence of the Oka and Don tills suggests that both ice sheets were spreading over a dissected terrain, partly filling the preglacial valleys. The Siberian plains experienced at least two glaciations during the early Pleistocene: the Mansi and the Shaitanka separated by the Talagaikin interglacial (Table 2.1). The ice sheet dated to approximately the beginning of the Pleistocene is indicated by the occurrence of a till in the deep valleys whose floors are positioned below sea level. The glaciers were spreading from the elevated parts of the Central Siberian plateau. The early Pleistocene glaciation had considerable momentum. Its deposits are traced further east than those of the middle Pleistocene ice sheets. In the mountains of north-eastern and Southern Siberia, the ice sheets were less developed and alpine glaciers prevailed. Although there is unambiguous stratigraphic evidence confirming that ice sheets were extensive in the early Pleistocene, they exerted little influence on the later geomorphic processes and are not expressed in the present-day topography. In line with climatic cooling, Northern Eurasia experienced a more severe climate in the middle Pleistocene in comparison with the earlier stages. The glacial events of this period are well correlated across the region. The East European plain experienced an extensive Dnieper glaciation (see Table 2.1). Only the Don ice sheet occupied a greater area than the Dnieper glacier, although during the late (Moscow) stage of the Dnieper glaciation the ice sheet shrank (Velichko, 1980b). The Dnieper glacier reached as far south as 49-50°N (Figure 2.2). The centre of the Dnieper glacier was located in Fennoscandia. The ice sheets smoothed out topography, eroded interfluves, and filled deeply incised valleys with till and melt-water deposits. Locally, the glacier deposited large volumes of till which formed belts of moraine ridges and hills. One such belt, which includes the Minsk, Smolensk-Moscow, and Severnye Uvaly uplands, is located to the north of Moscow and extends from the south-west to the north-east. In this region, the Dnieper till forms the base of the modern topography. The older landforms were partly destroyed by the glacier and the valley network was locally restructured such as, for example, in the upper Kama basin (Aseev and Doskach, 1974). Further south, the ice sheet had little effect on topography and the drainage network was restored soon after its retreat. This is probably because ice at the margin of the glacier was thin and easily broke down into separate blocks. Melt water accumulated in topographic depressions and formed valley trains grading into alluvial terraces downstream (Aseev, 1974). The Dnieper and Moscow ice sheets correlate with the Samarovo and Taz glaciations in Western Siberia (Table 2.1). However, it cannot be ruled out that the Siberian ice sheets belonged to two different glaciations separated by the Shirtinsky interglacial, while those in the European territory can be confidently considered as two stages of the same glacial epoch. The ice sheets on the West Siberian plain filled the preglacial valleys with till, glacio-fluvial, and glacio-lacustrine sediments. At present, glacial landforms here are almost indistinguishable because they have been strongly modified by stream and slope processes and solifluction, which developed during post-glacial warming. In Central and Eastern Siberia, the middle Pleistocene cooling and tectonic uplift resulted in the development of local glaciation in the Verkhoyansk Ridge, and the mountainous areas of the Taymyr peninsula and the Baikal region. These glaciers, however, left little visible impact on landforms except in the western foothills of the Verkhoyansk Ridge. There are traces of glacial advances in north-eastern Asia. However, it is still unclear whether these were two separate glaciations or two phases of the same one (Bespaly and Glushkova, 1987; Biske, 1978). The coldest period of the Quaternary, which occurred in the late Pleistocene, is well researched because it mostly lies within the limits of radiocarbon dating. 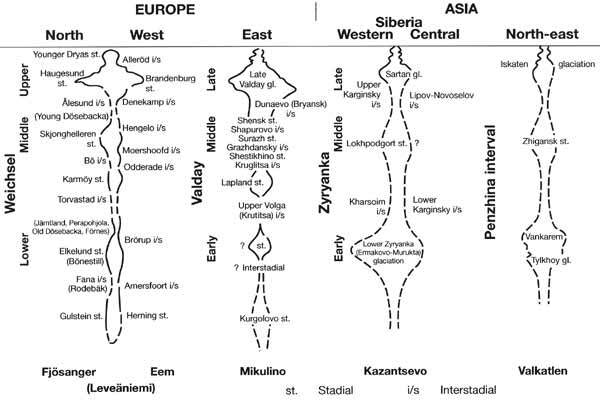 According to recent data, two principal stages of glaciation, dated to 100 to 50-40 Ka BP and 25-23 to 10 Ka BP, are distinguished: the early and the late Valday on the East European plain, the early Zyryanka (Ermakovo) and the Sartan in Siberia, and the Lazovsky and Partizansky stages in the Far East (Table 2.1, Figure 2.3). There is no consensus, however, on the size and rank of the two cold stages in various regions, particularly in Europe. Most researchers believe that the late Valday glaciation was more extensive than the early Valday, when the ice sheet did not extend far beyond the Baltic region. However, others (e.g., Zarrina, 1991) argue that both ice sheets were of similar extent. In contrast, the data on the early (before 50 Ka BP) Pleistocene glaciation (the early Zyryanka, Ermakovo, and Murukta) which occurred in Western Siberia, on the North Siberian lowland and on the Central Siberian plateau, are unambiguous. The ice sheets presumably spread from several centres located in the north of the Taymyr peninsula, Novaya Zemlya, Putorana plateau, and the Urals. It was suggested that glaciers spreading from different centres merged and formed a single ice sheet which occupied a considerable part of the Arctic shelf, the archipelago of Severnaya Zemlya and reached 65-66°N on the West Siberian plain (Kind and Leonov, 1982). At the same time, extensive alpine glaciation developed in the north-east of the continent. The early Valday-Zyryanka and late Valday-Sartan glacial stages were separated by a climatically complex interval marked by a considerable warming and decline of ice sheets. This interval is recognizable across the whole of Northern Eurasia (Figure 2.3). It is known as the middle Valday on the East European plain with the warmest phase of the Bryansk interstadial (35 to 25-23 Ka BP). In Siberia, this interval is termed Karginsky. In the opinion of some authors, the climate of the earlier phase was similar to today's climate (Arkhipov et al., 1993). Until recently, there was a debate about the extent of glaciation during the late Pleistocene maximum cooling which occurred 20-18 Ka BP (the late Valday-Sartan stage). In the 1960s, a so-called Panarctic ice sheet hypothesis became popular, according to which, centres of glaciation were located on the exposed shelves of the Barents, Kara, and Laptev Seas (Groswald, 1983). Recently, however, conclusive evidence against this hypothesis has been obtained. In particular, radiocarbon dating has shown that deposits, overlying those attributed to the Kara shelf ice sheet, are older that 40 Ka BP (Gataulin and Forman, 1997). This confirms the absence of the ice sheet from the Kara shelf during the last glacial maximum and proves that only a limited area in Western Siberia was covered by the latest ice sheet. It has also been established that the ice sheet, which developed on the archipelago of Novaya Zemlya, did not spread more than 100 km offshore (Pavlidis, 1982; Pavlidis et al, 1997). The ice dome, which developed on Severnaya Zemlya 18 Ka BP did not exceed the modern one (Makeev, 1979). Research, conducted in the mountains of the Taymyr peninsula, has confirmed that during the interval termed the Last Glacial Maximum (LGM) glaciation in this region developed locally (Velichko et al, 1997). Similar evidence has been obtained for the Anabar plateau in Central Siberia. Research in the coastal lowlands eastwards of the Lena delta has not revealed any proof of the existence of a glacial centre on the Laptev shelf (Pavlidis et al, 1997). These studies have conclusively established that the Scandinavian ice sheet was the most extensive at 20-18 Ka BP, during the LGM in the Northern Hemisphere. It occupied the north-western part of the East European plain (Figure 2.4) while glacial deposits in the north-east of the plain proved older than 30 Ka BP. Not only have recent data provided evidence for a localized rather than Panarctic ice sheet, but many accepted views on the late Pleistocene geography of Western Siberia have had to be revised in the light of new data. In particular, the idea of a vast proglacial lake dammed by the Kara ice sheet has been abandoned. In the north-east of Northern Eurasia, the valley glaciers of the Sartan epoch were even less extensive than during the early Zyryanka stage (Velichko et al., 1987). More extensive glaciation developed in the Verkhoyansk Ridge where valley glaciers merged leaving only isolated peaks free of ice. A progressive reduction in size of the glacial systems from west to east is typical of the LGM epoch while the previous early Valday-Zyryanka glaciation was characterized by a reversed pattern; the Scandinavian ice sheet was much smaller than the Siberian glacial formations. This can be explained by climatic asymmetry (Velichko, 1980a). During the early Valday-Zyryanka stage, when neither continentality of climate reached its peak nor heat supply reached its minimum, in eastern regions climatic conditions favoured the accumulation of solid precipitation. During the late Valday-Sartan stage, continentality increased and an anticyclone prevented the transportation of moisture by the westerlies in winter. Snowfall occurred in Scandinavia, fostering the development of the ice sheet. The anticyclonic conditions in Siberia and in the east of the East European plain caused intense cooling of the ground and the expansion of permafrost.